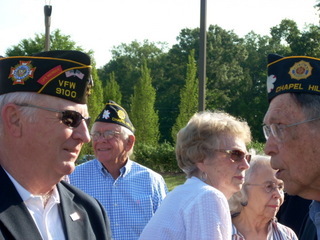 Americanism is an important American Legion program. American Legionnaires strive to do what we can to foster local patriotism and respect for our national ensign. We do this with ceremonies and flag honors. Edward Gill, our Second Vice Commander, ensures that everything we do with flags (education, presentation, assistance, historical, and flag retirement) is done the right way. VFW Commander Dave Lucas and Legion members Bill McCollum and Bob Patton gather at the dedication ceremony. We are honored to be included in a special event at University Mall on Flag Day, June 2011. A new flagpole was installed on Fordham Blvd. at the new mall east entrance. This replaced the dislocated flagpole at the Elliott Road mall entrance. Bud Hampton and Elmer Hughes raised the flag and Ed Gill served as our bugler. Lee Heavlin was the moderator and arranged for World War II members to participate. Garland Neville, VFW Chaplain, provided the dedication blessing and Legion Chaplain Peter O’Grady offered the benediction. The flag was hoisted promptly with the playing of the first note of Call to Colors, the traditional bugle call heard on military posts world-wide as our national flag is raised in the morning. Mr. Kenneth Jackson, owner of Wentworth & Sloan Jewelers, University Mall, formally dedicated the flag in memory of those who died “that Liberty might live” and placed a commemorative plaque at the flagpole. The dedication honored our nation and those who have served to defend and protect it. Its placement and support is a community and merchant-driven project. They are proud of our flag and those who have fought to preserve and protect it.